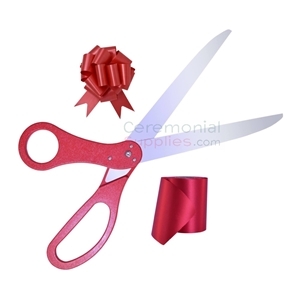 A set of scissors with the choice of a matching ribbon or combination in the two most popular colors for ribbon cuttings. These are the basic tools you need for a ribbon cutting ceremony. Your purchase includes a ribbon measuring 25 yards by 4 inches or 25 yards by 6 inches, and a pair of stainless steel giant ribbon cutting scissors in two size options - either 25 inches or 30 inches - and color options of red, maroon, blue, or black handles with the option of silver or gold color blades. The Ribbon comes in more than 21 color options. 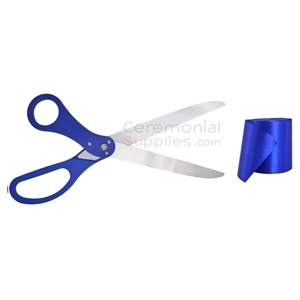 Giant scissors and the quintessential grand opening ribbon; these are the main components you will need for your ceremony, and CeremonialSupplies.com has the best combinations of these ribbon cutting supplies in grand opening kits. Of course, not all of our sets are limited to these two products. We have grand opening kits with additional supplies that can be paired up with the scissors and ribbon for optimal results. Colorful balloons, decorative banners and fancy bows can complement the primary products to create the perfect setting for your audience to appreciate. Grand opening ceremonies are all about impressions; let one of our kits help you make the best one possible. Remember that a grand opening is a perfect time to establish your brand as one that is all about quality. So choosing the right kit will have an impact on your grand opening day. In business, time is money. When planning a grand opening event, consider the time you would spend looking for each individual product. What if you could eliminate the time it takes you to research the needed products and to find the absolute best prices to fit your budget, all at once? Our grand opening kits are meant to do just that. We save time by hand selecting the best ribbon cutting ceremony products from our catalog and putting together in a ready-to go kits. We save you money by offering the them at prices that fit any business’s budget. Select from prepared kits in set colors or mix and match your own. Depending on the reason for the ceremony and the nature of the brand, different products may suit you better. That's why some of our grand opening kits come with different color ribbons, different sized scissors with different color handles and different secondary products—like bows, banners and balloons. For scissors, you also have the option to select kits with different metallic finishes. For very special (or luxury) events, scissors with golden colored blades are more appropriate, while more casual event will do just fine with the metallic stainless steel finish. Grand opening kits offer great pre-packaged ideas to make your event planning easier. That is what makes these sets a great buy! Simplify your planning by getting bundled supplies that eliminate the research. All the products in our kits may be purchased individually but we have put them together based on popular combinations from prior customers who have had success using them in their own grand openings. Though the choices may be obvious, a complete grand opening will take a little more than just scissors and ribbon. We offer kits that contain the right products for small business events and large corporate gatherings. 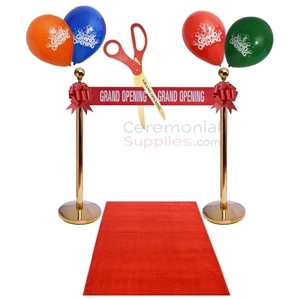 If you are in search of the perfect grand opening kit, CeremonialSupplies.com will help you find it. 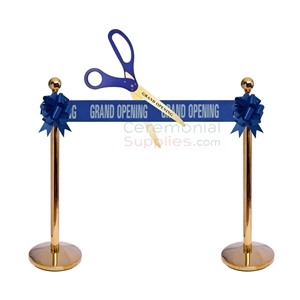 We are proud to be a one stop shop for businesses looking for supplies like ceremonial scissors, ribbon, giant bow, banners and other decorations for grand opening events and ribbon cuttings. We welcome you to browse our website or call us directly at 1877-373-4273 for more information about our grand opening kits and related products.